Global warming is almost certainly a product of the increase in the population of the earth from 2 billion to 7.5 billion souls in the span of less than a century. It is mathematically definite that the increase in body heat and cooking fires and auto engine heat alone will raise the natural planetary temperature to some degree. Add on factories and HVAC and land denuded for agriculture or meat, and other things needed to sustain a larger population, and there is even more natural and inevitable pressure increasing the planetary temperature. None of these natural increases are “caused by humans.” These natural changes are caused by the presence of more humans now than were on the planet before. This simple set of statements cannot be challenged as an explanation for significant portions of global warming. And it cannot be challenged that over the course of the twenty-first century there will continue to be staggering and inevitable increases in the population of humans on the face of the earth. 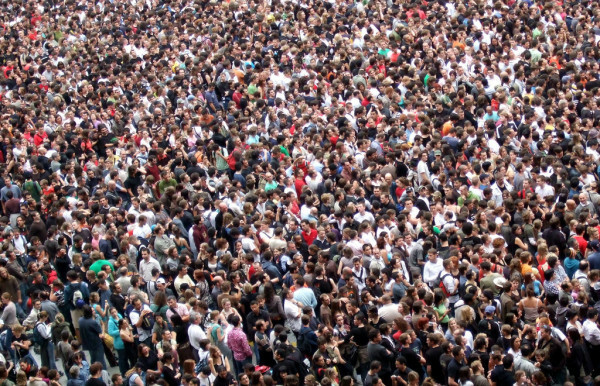 The UN estimates that the global population in the year 2100 will be about 11.5 billion people. To blame the activities of humans by saying global warming is “caused by humans” is a magnificent way of evading the Darwinian fact that in the absence of huge technological changes, current and future increases in population are going to cause human beings to be heavily impacted by natural selection. This is rock bottom Darwinian selection science which cannot be contested. Too many scientists and other professionals are constructing their theories of climate change around the assumption that the human species is an immutable production; and our human species was separately created and has been separately endowed with the pinnacle of all knowledge, power and glory which shall never fail. (Paraphrased from paragraph 1 of the introduction to Darwin’s “The Origin of Species.”) And that the human species in its present form must be preserved at all costs; and that there are current adequate means for doing so. Well, as the climate changes, and the globe warms, human beings will be among the species quite definitely impacted by the Darwinian law of natural selection. In truth, this is almost kindergarten science, except for the fact that everyone ignores what’s right in front of their eyes. Of course global warming and climate change are increased by the pollution from factory smokestacks and coal-fired electrical generators and such. It is certain that we need to do what we can to reduce such greenhouse gases and pollutants, within reason and without spending billions or more of the world’s treasure. The thing is, at the end of the day, after you’ve done everything in your power to reduce greenhouse gases and pollutants, all you’ve done is postponed by a few days the inevitable consequences of the huge and ongoing increases in the world’s population. And this world population, in the absence of sufficient technological innovation (not “climate change” technology), will inevitably undergo natural selection in the true Darwinian manner. At the beginning of the twentieth century, mankind accepted the fact that we could change only a few things right around us. Now we all have a mass delusion that we can alter the entire planet by our own efforts, and make the whole planet all the time do exactly what we want it to do. I’m sorry to tell you that the planet is not cooperating. It’s doing what it’s always done: act as a host for whatever species can selectively survive under the conditions presented by the planet. NO DOOMSDAY YET: We got through the last great population boom with flying colors! All is not lost, though! There is much reason for optimism based on what’s happened in the past hundred years. One very realistic hope is that we will develop the necessary basic working technology to handle the increased populations and increased temperatures over the next hundred years. We can’t know what man-made technology will be developed, since this technology does not exist in our time. For example, could the Internet even have been imagined a hundred years ago in 1917? Would you believe him, or would you prefer to imagine an apocalyptic scenario beyond the actual horrors he has predicted? Perhaps an attack from Outer Space? A fight between Batman and Superman? The way we got through the last ninety years’ population surge was due to technological advances which NO ONE could have predicted in 1927. Air travel, computers, HVAC, sophistication of motorized vehicles, crop increases, electrical production and so on. There is actually a huge amount of unoccupied land planet-wide. Just look at the unoccupied land on any drive through or flight above your state or nation. The combined land area of the US states of North and South Carolina is about the same as the land area of the Philippines. The population of the two Carolinas is 12.4 million now. The population of the Philippines is 104 million now. This means that the North and South Carolina population could increase to 104 million people and continue to function, even with current technology. The land areas of California and Japan are roughly similar. Yet the current population of California is about 35 million and the current population of Japan is 127 million. And Japan functions quite well, with current technology. According to https://persquaremile.com/2012/08/08/if-the-worlds-population-lived-like/, if the entire earth’s population of 7 billion lived in an area with the present density of New York City, all seven billion people will be able to live within the borders of the US state of Texas, with the rest of the planet empty of humans. Thus it’s easy to see that the land area of the earth has plenty of space for even a doubling to 14 billion people, yet not enough logistics, including food production, irrigation and drinking water. Right now we can’t imagine the scientific and cultural advances which will make this possible. Looking back to 1927, there is reason to postulate that there will be additional scientific and cultural advances which do not exist today, yet as such cannot at all be factored into any population analyses. Most of the technology we take for granted today would have gotten a person in 1927 locked in a mental hospital if this person had described them then. Thus one may conclude that much of the money now being spent on stopping global warming might be better spent in research and engineering to uncover the technology which does not exist today: the new “Internet”, or the new “jet plane,” or the new “seeds” which will increase crop production (GMO is only in its infancy right now!). Or, we may not gain the kind of technological and cultural advances we need to proceed smoothly to a population of 11.5 billion. Whether we do or do not make advances to support a larger population is entirely, totally speculative, with no answer since we can’t see into the future. If these advances do not come, then the form and structure of mankind will likely be radically altered due to the planet generating Darwinian changes in human beings; and there may be local or regional natural extinctions. Yet mankind will certainly not cease to exist, and may even be improved by Darwinian natural selection! Quoted from Time Magazine, October 16, 2017, page 54. I agree with your basic concept in your answer to this question, yet there are some other things I like to consider. For instance, does the fact that I am not a screaming madman mean I don’t care about the environment? No, what I feel is that what is happening is inevitable and Darwinian, so living my life is the best option. Plus, there’s no evidence for a “mass extinction.” The evidence favors Darwinian change over time based on new planetary conditions. The delusion is that we can change the whole planetary weather conditions and toxicity by earnest work through charitable organizations, and individual choices on how we live.